As a business owner, you have a lot on your plate. You’re constantly finding ways to market your brand. You also need to measure the success of your marketing campaigns religiously. You’re doing things to keep your customers happy. Your sales need to improve if you want to grow. Last week you heard that the competition was interested in moving in next door. You’re solving problems and creating solutions on a daily basis. As if that weren’t enough, one of your employees suggests you get familiar with social media marketing. Another part of running a business to worry about. But she did make a good point: 50% of customers buy based on recommendations shared through social media. How can social media help you run your business? Let’s talk about how social media can be used to address the everyday problems mentioned in the first paragraph. Problem numero uno; brand awareness. It’s a fuzzy term, but an important one nonetheless. Brand awareness doesn’t necessarily mean being known by the entire country, continent, or the world. That would be nice, but your small coffee shop might not be able to handle that sort of foot traffic yet. You’ve probably heard from other small business owners or marketers that brand awareness is easily generated with digital marketing. Digital marketing has given you the power to establish your brand through many platforms. A healthy balance of earned, owned, and paid media trifecta should be used when creating brand awareness. Owned media includes the channels that your business owns, such as your website. Paid media includes media that you have to put some skin into. The most widely regarded paid media channel is Google AdWords. There’s also earned media, which is arguably the most effective of the three types of media. Earned media is essentially your brand’s ability to generate a buzz through social media campaigns. This includes shares, mentions, reposts, or product reviews. Earned media is created by your audience, which can translate into word of mouth marketing. So how can social media marketing solve your brand awareness problem? Social media falls within the earned, owned, and paid media trifecta. Creating social media accounts can help you showcase your brand and culture. Social media gives your target audience a place to interact with your brand and connect with other audience members. Your social media accounts are a part of your brand’s owned media. “If you build it they will come.” Is completely wrong. Not only is the saying misquoted, it’s also not true in a business sense. What’s the point of building a phenomenal product without telling people about it first? This is where paid media can help you build that initial following. Social media platforms like Facebook, Instagram, Twitter, and YouTube can be used to spread your brand’s message. Injecting some dollars into sponsored or paid advertisements can help speed up that process. Paid media can help connect you with your audience, but it’ll rely heavily on the content you’re using in your paid media campaign. Neil Patel has a detailed guide on how you can produce paid social media content that works. You’ll know your owned or paid media is a big hit when the earned media follows. Retweets, shares, reviews, or any other form of user-generated content is the key to generating genuine brand awareness. You can invest in as much paid media as you want, but you’ll need to get your audience’s engagement. Nobody wants to listen to the guy who bought that annoying megaphone. They want to hear what other people have to say. Earned media can be an absolute gold mine for generating brand awareness. In 2014, Uber generated 87.5% of it’s YouTube views through earned media. That’s 87.5% of their views created as a result of user-generated content. Imagine how much that would have cost them through paid advertising. Ever heard of Coca-Cola’s “Share a Coke” campaign? In the summer of 2015, Coca-Cola printed their labels with 250 of the most common names in North America. The result of the campaign was massive. In September 2015, the company earned more than 500,000 photos shared through the #ShareaCoke hashtag. The company also earned 25 million extra Facebook followers through the campaign. If it weren’t for their social media accounts, these two brands wouldn’t have the brand awareness generated by earned media. You don’t need a multimillion-dollar budget to acquire earned media. What you need is content that will engage with your audience and drive them to share with others. Conversations happen on social media in real time. If you’re operating a business that relies heavily on customer service, then social media can help you. Customer service is a huge reason you’re still in business. Your customers provide you with the cash that feeds you, your employees, and your business. being unaware of unhappy customers. You may have read that short list and cringed. Experiencing the effects of an unhappy customer can hurt. Remember that word of mouth is a two-way street: it can go extremely well, or horribly wrong. This is where social media comes in. Let’s take a look at how you can use social media to help alleviate these problems. Social media can help improve your response times in a cost-effective manner. In an NM Incite survey, 33% of social media users would recommend a brand that delivered fast customer service. Regardless of whether the solution was effective or not. Show your customers you care about them by providing quick solutions. This can help create positive word of mouth. Being proactive can help you deliver excellent customer service. Social media gives your customers a place to share their thoughts, and your brand may be on their mind. You can identify and solve problems through social listening. Social listening is the process of monitoring your brand across social platforms. Monitor what your audience is saying about your brand by looking through their comments and mentions. You can do this by searching for relevant hashtags, accounts, mentions, or target keywords. Proactively solving your customers’ problems will net you positive word of mouth. Social listening also lets you collect qualitative data. Your customers may be mentioning something about your brand or product that you may have overlooked. This lets you derive insights about your brand’s future decisions. Although social media can help you with your brand’s customer service woes, it is also a noisy world. As of January 2017, Instagram has more than 600 million active users. Twitter has 313 million active monthly users. In September 2016, Facebook clocked in at 1.18 billion daily active users. Now imagine your brand being mentioned in a sea of half a billion users. Although major social media platforms have tools you can use to monitor your brand, you may need more power to get the small details. There are plenty of social media tools, such as Hootsuite, that give you the capability of social listening. If you’re new to social media marketing, these tools can be easily integrated with your digital marketing campaign. Accountability is key – you need to be proactive after identifying customer pain points through social media. Your marketing campaigns only work when you know what metrics to use. You might feel the pain when it comes down to tracking your marketing efforts. How do you know that the highway billboard is working for you? Or that the local newspaper ad is bringing in business? Digital marketing is much easier to track versus traditional marketing methods. If you’ve already got a Google AdWords campaign set up, chances are you have a good idea of where your performance is at. Being equipped with resources such as Google Analytics can help you measure success. Although social media is another marketing platform to worry about, it’s necessary for this day and age. The way we communicate has evolved, and many of us rely on social media. Measuring your success on social media might seem straightforward at first. It’s a common thought that brands with more followers are successful. This is why business owners end up disliking social media. Vanity metrics such as followers and likes can cloud what you should really be measuring. The money lies in brand mentions, social shares, referred traffic, and engagement from your community. When you start using these metrics, you’ll begin to identify what works and what doesn’t. Content that resonates with your audience will generally get you more engagement and social shares. Social media gives you an opportunity to test and measure your marketing tactics. But measuring success can only begin once you’ve outlined your goals. For example, your goal may be to generate brand awareness within your target audience. How are you going to measure achieving this goal? Your goal is to draw eyeballs towards your brand. Although it may be easy to default to measuring an increase in followers, you’ll want to focus on metrics like reach and exposure. The number of impressions you create should increase as your campaign progresses. You should be seeing an increase in new visitors. Most social media platforms will give you a dashboard to measure these metrics. Facebook has page insights and Business Manager. They also power a unique “people-based” measurement system called Atlas. Instagram uses Facebook’s page insights system as well. If you’re on LinkedIn, you can use Company Page Analytics to track your progress. Social media platforms are equipped with tools you can use to track the success of your marketing campaigns. It may require a few days to learn at first, but knowing what to measure will get you to love social media. Although some metrics may not be as transparent as you’d like, they can give you a much better sense of whether your campaign is working or not. As discussed earlier, social listening can help you collect data. But the data doesn’t have to be limited to your brand. Social media can be used to watch your competitors as well, which is a huge step in being proactive. Competitive intelligence obtained through social media can help you predict your competitor’s next move. Especially when the data is created in real-time. Tweets, shares, and posts about your competition can answer a lot of questions you might have had. You want to be a step ahead of your competition, right? Monitoring your competition’s target audience can be useful. Especially when you’re looking to expand your company’s target market. They could be reaching a completely different audience, one that you haven’t tapped into yet. You might end up finding a newer, much more profitable customer base. Follow any mentions or shares about their brand and find out why people talk about them. Is it because their product or service has something you don’t? Have they left unresolved issues that you can potentially solve? Understand how your competitors interact with their audience. Identify what works for them. Find out what type of content gets their audience to start engaging. Look for potential gaps you can fill, such as gaps in their customer service. Tracking what your competition is doing can help you create marketing initiatives of your own. Maybe you’ll craft a campaign aimed at acquiring their customers left with unresolved issues. In the case that they are a complete ghost on social media, you will still likely find people talking about their brand. Their employees or customers could be mentioning their brand right now. This is why monitoring social media is important – conversations are happening all the time. You can even take this approach at a macro level. You don’t need to focus on just the local competition. Learning what works for your competitors in the next state or country can also help you sustain a competitive advantage. Once you’ve done a thorough audit of your competition, you might end up with some inspiration for that next piece of content. Fewer than 50% of all small businesses using social media are actually creating content for lead generation. Why? Social media makes it easier for businesses to connect with potential customers. 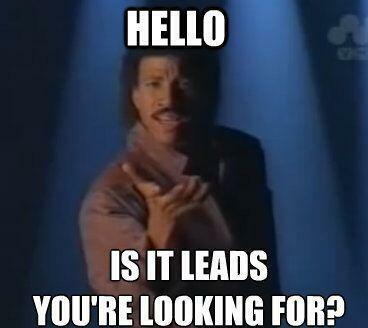 It also helps your sales people follow their prospects down the sales funnel. It might be because social selling is a fairly new concept. There’s a reason why sales people find success in using Twitter and LinkedIn to engage with prospects. Marketing your product or service gets the attention of your audience. Social media marketing can help your prospects progress through your sales funnel. That’s if your content is made for prospects at each step within your sales funnel. That means creating content that generates awareness, to inspiring action. If you have a strong content marketing campaign, you are more likely to generate leads. Acquiring more inbound leads will help your sales team close at a higher rate of succession. Have you ever seen a sales team fight over an inbound lead? This is why you need to empower your sales team by leveraging social media. This is where your marketing and sales departments need to work together. Your marketing department can take care of social media monitoring. They can provide data to your salespeople that can result in a higher closing rate. Since your sales department interacts with your customers frequently, they can give your marketing team a few clues as well. Your sales department knows the type of language their prospects are most receptive to. Remember when we talked about listening to your competitor’s unhappy customers? Social media provides opportunities you may not have had before. Your sales team would love to speak with your competitor’s unhappy customers. This gives them an easy way to execute sales 101: listen to the prospect, provide a solution, and ask for the sale. It’s fairly straightforward that a thriving sales team results in a healthy business. Give them an advantage by using social media to keep their prospects engaged. Although social media is one more thing to worry about, the return on investment can be huge. Social media can, in fact, make running your small business much easier. With social media, you can: create and measure brand awareness. You can deliver excellent customer service. You can be a step ahead of the competition – or even fire up a sales team to crush quotas. There are plenty of ways you can use social media. The way you communicate with your target market has evolved into something much different. Social media is here to stay, and that’s where you will spend most of your marketing efforts. How do you currently use social media for your business? Is there anything you would add after reading this article?